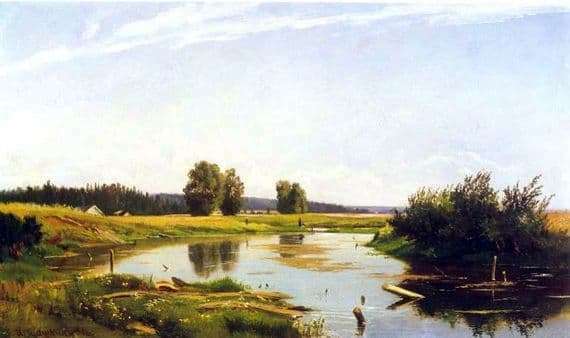 Shishkin is a famous Russian artist, at least known to all by the painting “Morning in a Pine Forest”, which is printed on a wrapper of sweets and often catches the eye, as the most famous work of the master. Many of his paintings are exhibited in museums, some – next to the works of European masters. He preferred landscapes and images of animals, on religious and mythological themes, so popular in his time, did not write. He loved Russian nature and dumped her glorification a lot of power. Even Shishkin died at the easel, while working – he died just as he lived. “Landscape with a lake” is one of the typical works for him, realistic and bright, it is remembered instantly, you just have to look at it. It depicts a lake – in the middle of a tiny island, on which bushes grow, the collapsed bridge turned into a pile of wooden trees and a pair of lop-sided piles. Grass and small white flowers grow on the shore, reeds are not overgrown, but they also exist. Beyond the hill you can see the village – just the roofs of a few houses – behind it is a forest that rises to a dark wall, but does not seem threatening. On the far shore of the lake, looking closer, you can see people – they may be walking, enjoying the sunny day, maybe they are going to fish or swim. Everything is bathed in sunshine – the picture is full of light. The lake reflects the trees and the sky – high, sonorous, almost devoid of clouds. Everything is done in bright colors, with the use of warm colors – the picture conveys a feeling of summer, freedom, warmth, the wind rustles in the treetops, human voices are heard from the village and it smells of smoke. The landscape is vibrant, I want to step into it, like at a door painted on a wall – only sound thinking stops. Above the sky, a white strip of clouds stretches across the sky – thin, tremulous, written not in pure white, but with the addition of a heavenly color. And it is beautiful, and adds painting.